The Wabbit couldn't resist looking out and back down the line. The figure was waving at him. The train hurtled through the night but the figure stayed exactly the same distance away. An eastbound express flashed past and smashed over the figure - but when it had gone, the figure was still standing. He could hear it shouting "You got me, Wabbit. But there's always next time." Its edged weapon glowed red in the night. Lapinette tried to pull the Wabbit inside but it was all too fascinating. The Wabbit stared and stared. "The more you look," said Lapinette, "the more powerful his hold over you becomes." So the Wabbit ducked inside and let it be. "I doubt we've seen the last of him." "He's your doppelganger," said Wabsworth. "Well I don't like him," muttered the Wabbit, "he's thoroughly unpleasant." "Is the game finished now?" sighed Lapinette. Wabsworth grinned just like the Wabbit. "No game is ever quite finished." Lapinette grimaced. "I want my edged weapon back." Wabsworth pointed. "It's exactly where you left it." Lapinette fished in her frock and produced it. 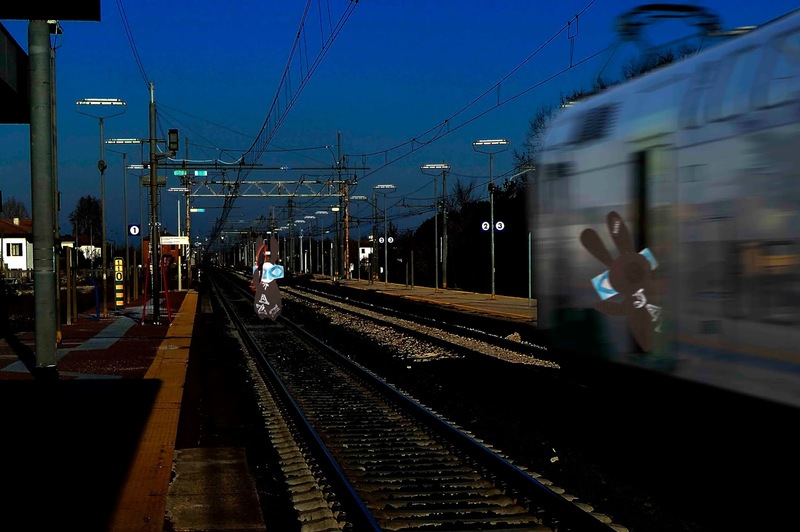 The Wabbit ferreted in his fur and found his very own automatic with the missing safety catch. Wabsworth took out two walkie talkies. The train rattled across points and through dark stations. Skratch's voice crackled over the loudspeakers. "Where would you like the next stop of this train?" "Home," said the Wabbit. "Just take us home."